It’s now that time of year. The summer season is well in the past, we’re settling into fall, and looking forward to the winter season, (at least the fun parts of winter). The Thanksgiving holiday is just around the corner and if you are hosting this time, remember that picking the right Thanksgiving music will play a role in the success of your dinner. If you are hosting one of these get-togethers, you are probably already beginning to stress out about all the details that have to be handled. One of the best things you can do to make the big event less stressful is to handle as many of the details ahead of time as possible. That way, as the big day gets closer, you only have to worry about the true last-minute items. Picking the right Thanksgiving music is one of those items you can do now and check it off the list. There is an art to picking the right music for family get-togethers. 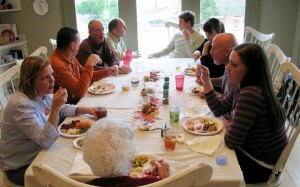 Some families seem to seamlessly blend together once a year and get to that old, comfortable feel right away. However, other times, it can be a little stressful to spend time with so many people you may not be all that familiar with. Families are also known to occasionally have conflicts within them, so it’s best to play something relaxing. Regardless of the details of your specific family, it is a good idea to have some good Thanksgiving music ready to play in the background. This type of music is perfect for setting a nice, peaceful, comfortable tone for your holiday. One of the most popular types of Thanksgiving music is to have a crackling fireplace in the background. This works for most of the activities associated with Thanksgiving, from gathering around the table for the big dinner, to the post dinner couch-time conversations and everything in between. Fireplace sounds are the most common, but most types of nature sounds will have the same effect of being surrounded by comforting, relaxing music, as long as you stay away from the thunderstorms. It’s always a good idea to have some nice, relaxing music on hand too. This is a great choice for when you’re all gathered on the couch after the big dinner. You don’t need anything up tempo, you just want something in the background that will help everyone relax and enjoy the time together. Another good idea for background music for your family dinners is to find music inspired by special memories from when you were all together in the past. Did your family used to go camping? Spend time on the water? Live in a big city? Have a favorite cat? Of course, you can also go the other way on this if you have a family member who is afraid of birds or had a (non-serious) “traumatic” experience. It’s sure to liven up the party if you have some background music ready that allows everyone to relive the adventure. If you are hosting the Thanksgiving Day get-together this year, handle as many details ahead of time as possible. If you get those details handled, and pick out a selection of ambient music tracks to help set the tone, the actual holiday will be much less stressful.